The clocks went back last night, so I got an extra hour of sleep. The bed turned out to be comfortable enough that I slept very well. As I was getting ready for bed last night, I realized I could hear snoring coming from the room next to me, and it was very loud! Thankfully the earplugs worked. I went downstairs to have the buffet breakfast. I was hoping for some kind of hot food, but it was mostly a carb fest. At least I can actually eat it here! I ate more than I probably should, but I didn’t know if or when I would get lunch. At 9:22 I left to start walking to church. I was about 20-25 minutes away by walking. I found it easily without any problems. Everyone was very nice, and the women who didn’t know me at all greeted me with kisses. It was nice to go to church for the first time in 7 weeks, but it wasn’t as nice as it could have been because I didn’t understand anything. And as I was sitting there, I was just falling asleep. On the camino, if you don’t keep walking, you just fall asleep. I went back to my hotel for an afternoon nap. I got up and went to see the Cathedral around 4. As a pilgrim it only cost 3.50 to get in, and there’s a hand held audio tour. It took 2 hours to go through and see everything. It really is incredible. Gothic architecture is amazing. The whole thing is amazing. There are all of these side chapels that were completed at various times and in different styles. There are two levels of cloisters. I have to split this into smaller galleries. look how far I’ve come! As you leave, you go through a gift shop. I was looking at everything, even though I probably shouldn’t have. Everything was very reasonably priced, though, which was very surprising. 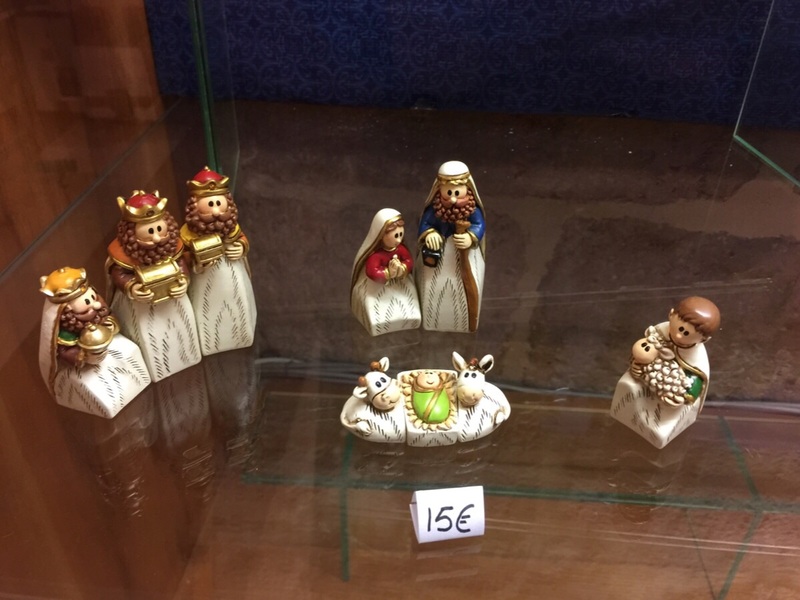 I fell in love with a little nativity set, and I knew if I didn’t get it I would regret it for the rest of the trip. It was only 15 E, but it is kind of heavy. I might have to try to mail it home. I ran into Mickey in the gift shop! He said his back is out, so he can’t walk much, with or without a pack. He’s bussing everything now. I’m sure it’s disappointing, but he has done the camino before, several times. After the Cathedral, I found myself walking up the hill behind it, and I’m very glad I did. There’s an amazing view of the city from up there! While I was in the Cathedral taking the tour, I realized I was very, very hungry. I hadn’t eaten lunch. I decided to just get a pizza and take it back to my room. On my way back, I passed a little pastry shop and bought myself some dessert as well. I don’t know how far I’m going tomorrow, but I think I’m still doing ok on time. I did do a lot of walking around the city today, and my feet and legs hurt. It’s not much of a rest day when you have so much to see. I am planning on sleeping in a bit and taking my time tomorrow. I don’t need to be out by 8. The meseta starts tomorrow, and I’m actually looking forward to it. I’m now officially under a month left in my trip. The countdown has begun. I hope you can get as far as you want to go in the last month! You’ve come a long way, baby! Thanks for including the map. Excellent pictures. What a cathedral! The nativity set is darling. I’m glad you got it, and I’m glad you made it to church. 🙂 What’s the meseta? The Meseta is a long stretch of flat land, with few trees or anything else of visual interest. It’s a barren, unexciting walk (unless your feet are tired of hills, I suppose). I understand that many people choose to bus across the Meseta portion of the Camino because they dislike the monotony of the landscape. That cathedral at Burgos is a stunning work of art. I find it troubling that I know so little of Spanish art, architecture and culture. In my Humanities degree, we studied the arts and letters of Western Civilization, and Spain hardly gets a mention in all the French, German, Italian and English things that get thrown around. It’s very much on the periphery of things, physically and culturally. I wonder if it has anything to do with the Muslim conquest and the Christian Reconquista, and how that “interrupted” the continuing culture? I’ll have to consider this further. That really is a beautiful cathedral! Beautiful cathedral!!! Seriously Betsey, your photos are like eye candy! !